Australian Kelpie Dogs - The Kelpie is an Australian sheep dog that has proven very successful at herding and droving with little or no command guidance. They are medium-sized dogs and come in a variety of colors. Kelpies have been exported throughout the world and are used for herding livestock (primarily sheep) and poultry. The breed has been separated over time into two distinct varieties: the Show Kelpie and the Working Kelpie. The Show Kelpie is the variety that is seen at conformation dog shows. They usually have little or no herding instinct. Show Kelpie breeders tend to call their breeding establishments "kennels", whereas Working Kelpies are bred for their herding instincts and breeders tend to call their breeding establishments "Studs" in a similar way to cattle and sheep Studs. The Australian Kelpie is not currently recognized as a breed by the AKC. This information is licensed under the GNU Free Documentation License. It uses material from the Australian Kelpie article on Wikipedia.org. Australian Kelpie Breeders - Advertise your kennel puppies and dogs here. 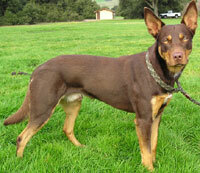 Eurowenban Stud - Australia - We breed our Kelpies for temperament, type, intelligence, ability and soundness. The Black & Tan, Red & Tan, Blue and Fawn "Eurowenban" Kelpies are eye-catching. Come to our website for litter notices on our Australian Kelpies. 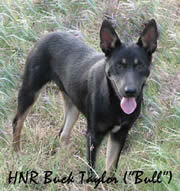 HNR Working Kelpies - Texas - We breed the Kelpie with the working cowboy and family in mind. Our Kelpies are excellent working dogs as well as family dogs. Started and puppies available.